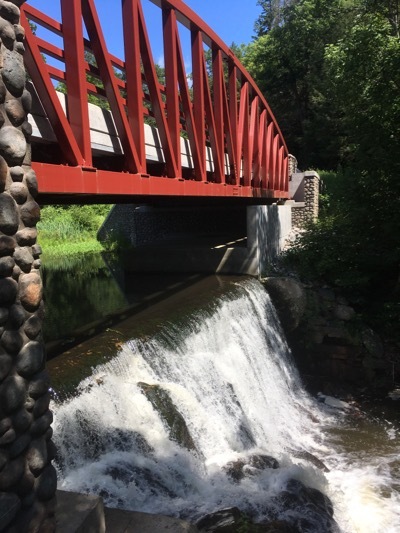 Granby is home to one of the best waterfalls in the entire state. That would be Enders Falls and if you are any sort of waterfaller, you’ve probably been there. It is also home to Carpenter’s Falls, which require a modicum more effort to find than Enders, but are worth it – at least during wet periods. However, this page is about some lesser-known falls in Granby. 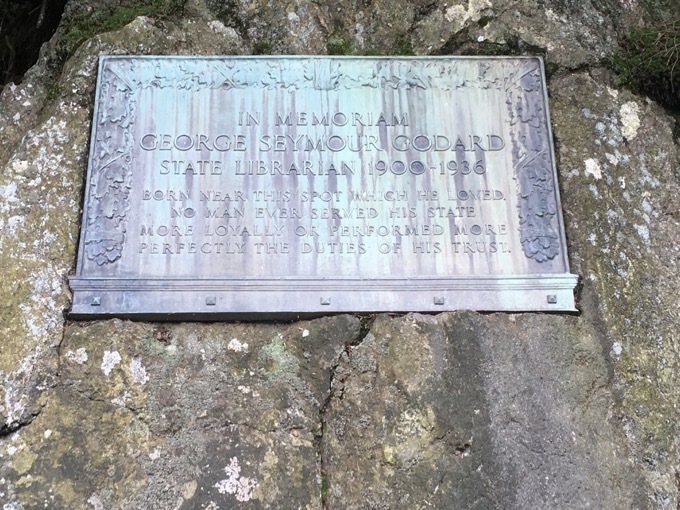 One I found on the indispensable More Waterfalls section of New England Waterfalls, one I kept passing on my Granby adventures, and one I found on the straightforward and thorough David Reik and Judith Lohman Pictures blog. 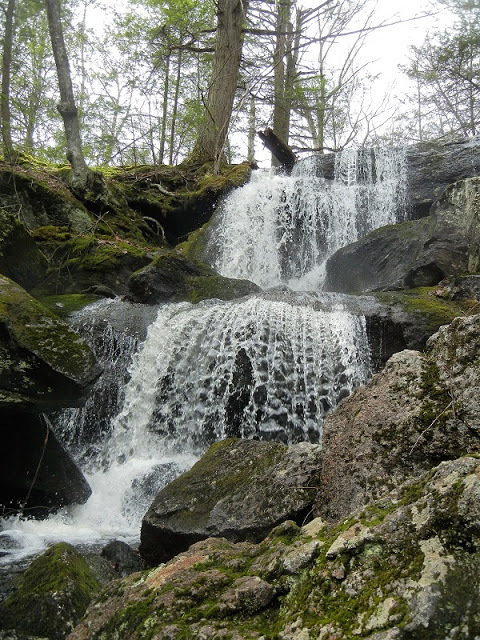 This is a rumored waterfall on Belden Brook; it is supposedly located in the Tunxis State Forest off Lost Acres Road near the Granby/Hartland town line. 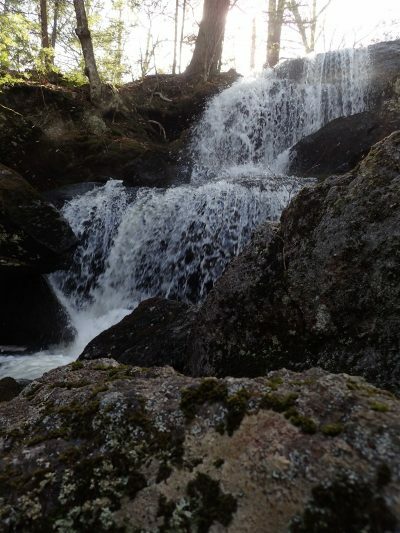 The falls are “less than 0.1 mile from the road where Belden Brook runs over a steep, rocky slope. Though they are close to the road, the approach to them is very steep, trailless and slippery after a rainfall. It is still “rumored” as far as I’m concerned.. UPDATE: Mere hours after publishing this page, these falls have been confirmed. There is a distinct lack of safe parking up there for one thing, and for another, I visited during a very dry period. It didn’t seem worth my trouble finding sketchy parking, scrambling down a steep hill, without specific knowledge of where I was looking. Logic/educated guessing would put these falls within this circle, probably near the thicker gray contour line. Thanks Justin for the photo and the confirmation of my guess as to where it is. I asked about parking and he said he just left his car on the (skinny!) road and went for it. I would guess you can park at Lost Acres Orchard and walk a bit to get to these falls if you value your car more than Justin apparently does. This is an odd little spot. From what I’ve seen, it’s beautiful. And probably a bit dangerous. There are dozens of “No Parking” signs along the roads here, but there is a pull-out just north of the Granville Road/Silver Street intersection. If you need to see these falls, park there. That is quite a statement for a librarian. Well done, Mr. Godard, well done. 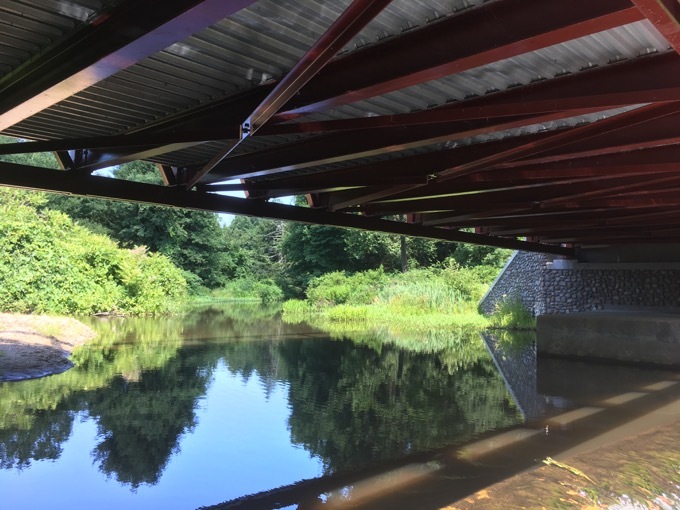 Back across the street, there’s a new Silver Street bridge across Belden Brook. And under that bridge? Why yes, there’s a little waterfall. I’m guessing that at one time, this was a natural cascade, but probably not a true “falls.” Now it’s a semi-fake falls – and it’s almost literally impossible to get a good photo of it from below. I’m sure You can walk down Granville Road and find a spot to scuffy down the very steep gorge to do so, but I didn’t feel like doing that. Although, that gorge looks kind of neat from above. So, if someone wants to do that, go for it. But I didn’t tell you to do it, because you might get hurt. And I don’t want anyone to get hurt. And the pictures may not be all that great. Don’t do this. I’m going to steal pictures of these falls. CTMQ reader Sarah at GranWood Explores found the falls a few months before my visit and took a great picture of them. It is somewhat surprising that these falls have not made it into any guide I’m aware of. McLean Game Refuge is rather huge and one of its tentacles extends northwest all the way up to route 219, just east of Enders Falls. 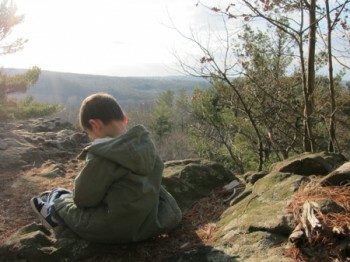 It is surrounded by Granby Land Trust, Holcomb Farm, and Enders State Forest land up here – and one can hike all over the place among the various properties. And you should; it’s beautiful. 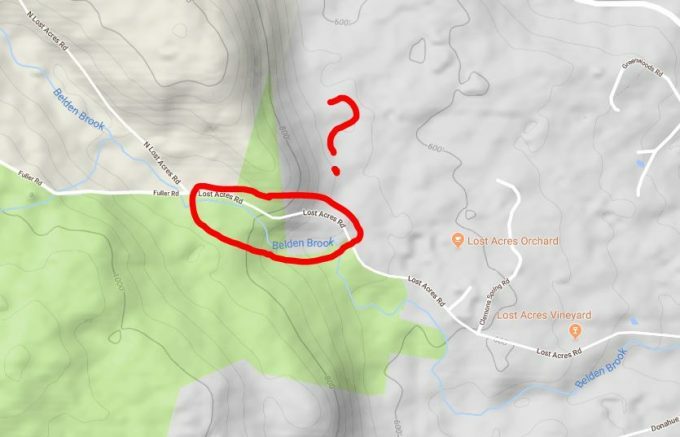 There is a newer McLean trail called the Pine Cone Trail that leaves the unimproved (and undriveable) Broad Hill Road, not too far from Carpenter’s Falls. As you hike the Pine Cone Trail, it begins to ascend in earnest you’ll notice a gorge appearing to your left. The falls are down there. 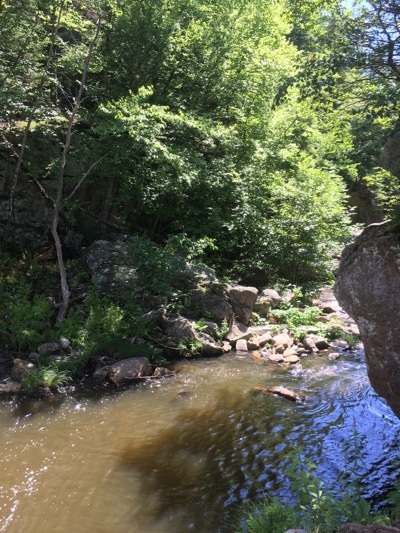 It requires a bushwhack… although there is an old woods road that veers left towards Beach Brook downstream from the falls. I imagine you can reach them that way… or bumble down the steep hill about 3 minutes up the hill from the fork with the old woods road. Your choice. Photo from Dave Reik. He provides their exact location here. 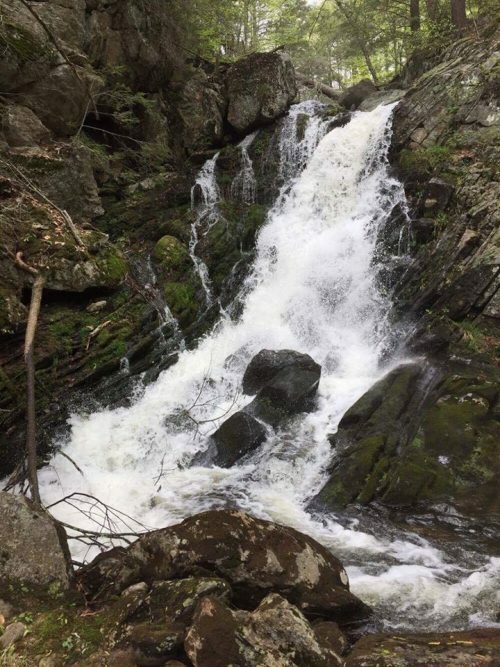 Sarah from GranWood named them “Old Beach Brook Falls” and Dave Reik named them MJ falls after the woman’s initials who told him about the falls. I think. I visited them after a month of almost no rain, but it’s still a very pretty area. An area which will lead the intrepid hiker to all sorts of cool stuff. In fact, the Pine Cone Trail will take you down to Enders Falls themselves if you keep going past the official end of that trail. I suspect the future CFPA East-West Trail may do this exact thing, but time will tell. I am honored to have made it to your website. 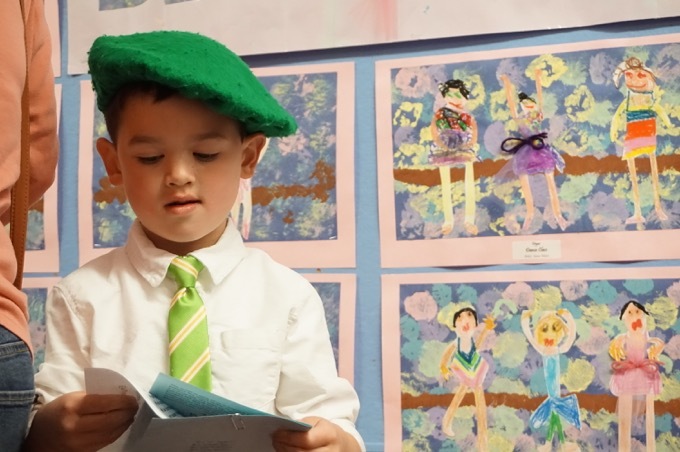 You are my go-to source for things to see in CT.